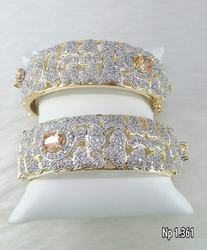 Pioneers in the industry, we offer a wide range of Designer Bangle. 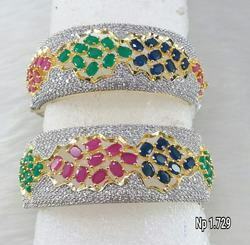 Offered designer bangle is manufactured using supreme grade materials under the supervision of our dexterous professionals with the aid of innovative techniques. 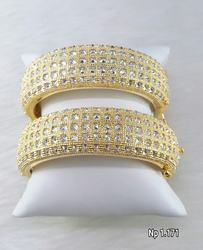 Our designer bangle is available in numerous designs & sizes according to the needs of customers. 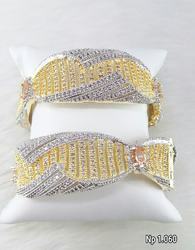 This designer bangle is highly acknowledged among our esteemed clients for their unique designs and appealing patterns. 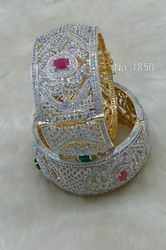 With vast industry experience and deep knowledge, we are offering Emerald-Ruby Designer Bangle. 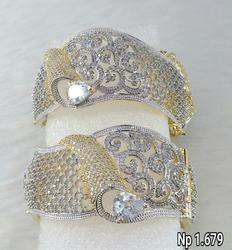 Designed with heavy work of embellishments, these bangles are worn by brides on their wedding day. Apart from this, we provide this designer bangle in plethora of design, sizes and patterns as per requirements of our esteemed clients. This designer bangle is largely demanded to be worn as casual accessories.